The exchange-traded fund (ETF) industry in the U.S. continues to witness strong growth thanks to the growing popularity of the investment channel among retail and institutional investors. Total assets under management across all U.S-listed ETFs grew by more than 30% in the last four quarters – bringing the total asset base to a record $3.15 trillion by the end of Q3 2017. While the five largest ETF providers (BlackRock, Vanguard, State Street, Invesco and Charles Schwab) command a market share of nearly 90%, the top 3 players stand out in particular with a combined market share of 83%. 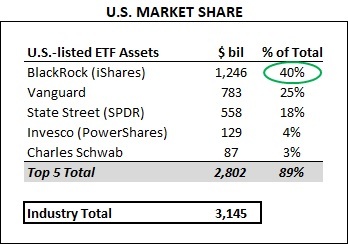 It should be noted here that the top-three players also account for more than 70% of all ETF assets globally. While custody banking services contributes to most of our price estimate of $100 for State Street’s shares, the bank’s ETF business is the single biggest profit driver for its investment management division. The table below has been compiled from data gathered by ETF.com and captures the changes in U.S. ETF assets for the five largest ETF providers in the country over the last five quarters. As seen here, the total size of the U.S. ETF industry has swelled by more than 30% over the last 12 months, with the top 5 players together reporting growth at a faster rate than the industry. The fact that BlackRock and Vanguard continue to grow at rates well above the industry average is noteworthy given the sheer size of their asset bases. Both asset managers have done well thanks to their extremely low-cost core ETF segment targeted at retail investors. Additionally, improved valuations across debt and equity securities over the first nine months of 2017 also boosted the value of their assets under management. In fact, we expect the market share of the 5 largest ETF providers to cross the 90%-mark in the current quarter or the next primarily because of the impressive growth figures for BlackRock and Vanguard. State Street and Invesco stand out here, as their y-o-y growth figure of 22% is well below the industry average. We attribute this to the fact that both these ETF providers continue to focus primarily on institutional investors, even as the retail investment segment grows at a faster rate. This has hurt State Street in particular over the years, as the bank was one of the pioneers in the ETF industry, and its sub-par growth allowed Vanguard to capture the #2 position among industry incumbents because of its aggressively priced ETF offerings. The chart below captures State Street’s ETF assets under management. You can see how changes to State Street’s asset base affect our price estimate for the company by modifying the chart below.